The U.S. Consumer Product Safety Commission in cooperation with Bugaboo Americas, of El Segundo, Calif.have recalled about 74,000 Bugaboo Bee Car Seat Adapter. When the adapter is used on a stroller that also has a wheeled board accessory attached for transporting a standing toddler, and the car seat is positioned so the child faces forward, the car seat can disconnect from the adapter and fall. Bugaboo received one report of the car seat disconnecting from the adapter and stroller frame, causing a minor injury. 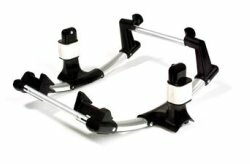 This recall involves the Bugaboo car seat adapter models 80400GC01 and 80401GC02. The adapters are devices designed to attach car seats to stroller frames. They are made of silver aluminum tubing and black plastic connecting parts. The Car Seat Adapters were sold at Babies "R" Us, Buy Buy Baby, Neiman Marcus, other department stores and independent juvenile stores, Bugaboo.com and other online retailers nationwide from December 2005 to July 2011 for about $45. They were manufactured in China. Consumers should immediately stop using the adapter and contact Bugaboo for a free service kit and decals.